Many areas of the world are seeing record high temperatures, which makes it even more important to ensure that your pets are kept cool. Veterinarians commonly see dogs with heat stroke, but most of these cases could easily have been averted with some easy precautions. The best method for keeping your dog cool is to simply allow him or her to stay inside a house with air conditioning. Dogs want to be part of the family and almost always enjoy being inside. 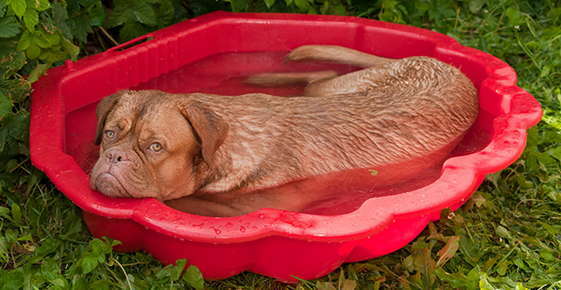 If your dog must be kept outside in the heat, one tool to help keep your dog from overheating is a child's small hard plastic swimming pool. Place it in a shaded area of the yard and fill with a few inches of water. Your dog can drink from it, walk through it, or even lie in it. Misters are another good tool which can be installed on your patio or any shaded area of your back yard. These emit a fine mist of water that your dog can use to keep cool. Another trick is to take large plastic jugs such as milk containers, fill them with water and then freeze them. Place outside in an area where your dog usually stays, preferably in a shaded area. Behind the ice-filled jugs, place an electric fan so it blows across the ice and creates a cool breeze for your dog. Of course, never leave your dog in a car without the air conditioning on. Even in relatively mild outdoor temperatures, on a sunny day the environment inside the car can get dangerously hot in just a few minutes. Never leave your dog tied to a tree or a post. A common scenario is for a dog to keep circling the tree, winding the rope shorter and shorter until it is caught close to the tree trunk. As the sun moves across the sky, eventually the dog is in the full sun, and not able to reach its water bowl to try to help keep itself cool. Heat stroke can quickly ensue. If your dog is heat stressed, it will be panting heavily, with its tongue hanging out long and wide. This increases the surface area of the tongue and allows for more evaporation to happen, which helps keep your dog cool. Another symptom is the color of the gums will be a very bright red or sometimes a muddy color. If you notice any of these symptoms, take action immediately! Cool down the dog and call your veterinarian for further instructions. Heat stroke in dogs is usually easily preventable. Using these tips will let you enjoy hot weather safely with your dog and may even save your dog's life!